To explain what is an infrared grill we have to get a little technical. But I like to use easy and plain English to tell what I found out about what is an infrared grill. There are probably better ways to explain it, but this is my way, after reading a bunch of technical stories about radiation heat and infrared stuff. In the regular gas or electric grill the flame or heating element heats the cooking grates. The hot air from the gas or element heats the air between the cooking grates and cooks the meat. The hot cooking grates give us the nice grill marks we all like to see on our meat. In an infrared grill however, in between the flame or electric element and the grate is a so called infrared element. 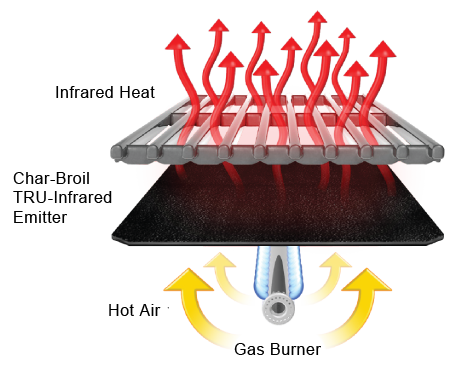 This infrared element absorbs most of the heat and then releases the heat to the grates where our meat is. This means that there is less or hardly any gas or electric heated air touching our meat. I still got a little technical, but hope I made it a little clearer. Some times a picture paints a thousand words, so here we have one to explain it in a picture. What is infrared grilling technology? First a little history how it all got started. In 1961, Bill Best, founder of Thermal Engineering Corp., Had patented the first infrared burner. This burner was only used for industrial machinery. Bill Best was also a backyard griller and build an infrared burner in one of his barbecues he had built to use for himself. This was when he found out about the faster cooking and all other benefits of an infrared grill that we mentioned here. All right, here we go with my explanation of the whole infrared technology. Hope you understand it! Gas and electric grills use hot air to cook our food. A dryer also uses hot air but this is used to dry our clothes. This means that the gas grill dries out our meat and that is a complaint you hear a lot. And that is one of the reasons why we inject and marinade our meat. To keep the moisture inside. These grills have no infrared or radiant heating at all. Charcoal is already a little better, because it has about 25% infrared heat and that is why the meat stays moister and not too much dried out like on a gas grill. Infrared cooking provides most radiation heat and this give a better result. Many commercial ovens and grills use this technique already for a long time, but now it is affordable for backyard grillers like you and me. The Char broil company is most known for their infrared grill for back yard grills. That is why have added some videos from their YouTube channel to maybe explain it better than I can. How to use an infrared grill and is it better? I have read many times that you have to get used to how to use an infrared grill. The cooking time is most of the time less then when a regular gas or electric grill is used. For the rest it is used as any grill and there are no special cooking methods that I could discover anywhere. Most new users write that their meat cooks faster and is moister then with their old grill. Flare ups are almost things from the past with an infrared grills. Reason is that the strong airflow that comes up from the burner vaporizes the drippings before they hit the burner. There is no real contact between the gas burner or electric element to start a flare up or grease fire. The higher temperature sears the meat faster and the heat is supposed to be more evenly distributed to the grilling area. Should I buy an infrared grill? That is a question I hear and see a lot. It is not easy to answer this question, because it all depends on your specific situation. The average price is a little higher, but the quality of the cooking is better. With so many options available to choose from electric patio grills to 3 or even 5 burner full size outdoor kitchens, I think there is an infrared grill available for every grill master. But look at your style of cooking and decide if a infrared will make it easier or improve the quality of your food. Click here for all the reviews of Char Broil infrared grills on our website. Looking at the infrared pros and cons I can only tell you this from my own experience and after using my Char Broil grill2go X200 (Read the review here) for few years now I have found only one disadvantage in grilling on a infrared grill and that is cleaning. Since the infrared grill grates comes with small holes they get clogged up and cleaning is sometimes a pain in the you know where. In my experience it is best to turn the grill up to high and let is warm up as hot as possible. This basically burns all the left fat and that makes it easier to brush if of. I really found out that using a high quality grill brush is a must have for an infrared grill. Many infrared grill come with a special type of forked device that you can use on stubborn holes in the grill grates. For more tips you can read my how to clean a BBQ article here. Here is a video from charbroil about their infrared grills. Although it sound a little like a sales pitch for their grill, I still think it adds value to this article to try to explain what an infrared grill is. That leads us to the final question. What is the best infrared grill on the market? This is also impossible to answer because it all depends on your personal situation. cooking for a large group requires a large infrared grill like the Charbroil gourmet series or even larger. For tailgating or to use as a grill for the campground I suggest one of the portable infrared grills because of the size an low weight. It is important to buy the right size infrared grill. This will make sure that you do not run out of cooking space or heat up a large infrared grill and just use a small area and waist a lot of propane gas. One thing I like to share and that is that I ate the best Thanksgiving turkey ever and to my surprise it was cooked an infrared turkey grill and you can find the 3 best infrared turkey fryers in this review. Feel free to leave a comment or you personal story or experience with any kind of infrared grilling. Thank you for this great explanation and the videos. Have been looking for an easy way to find out what infrared grills are and your way is the best I have found. Now I can start looking for the grill I would like to buy. Will use your reviews as a reference. Great informative site. Thank you for your kind words. Glad it helped you. If you need more information just contact me.